Daily Cheapskate: GAME-CHANGER! eShakti: the fashion-conscious modest dresser's dream come true. 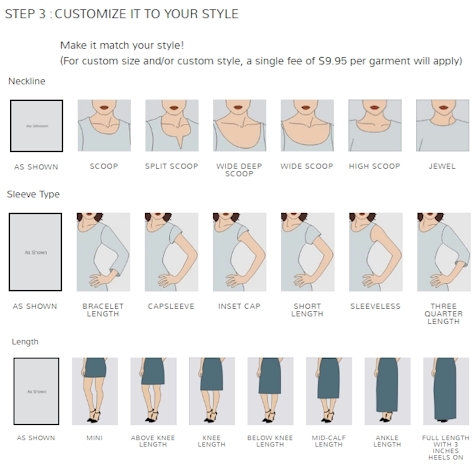 Customize your neckline, hem and sleeve length on almost anything! GAME-CHANGER! eShakti: the fashion-conscious modest dresser's dream come true. Customize your neckline, hem and sleeve length on almost anything! Dressing modestly, fashionably and under-budget simultaneously often requires ingenuity. Fashion-conscious modest dressers have a few alternatives: 1) we can use shells and underskirts to make fashionable clothing modest or 2) we can spend a ton of money on fashionable modest clothing in places in New York like Flatbush, Boro Park or Monsey or 3) we can wear boring clothing that is modest and well-priced. 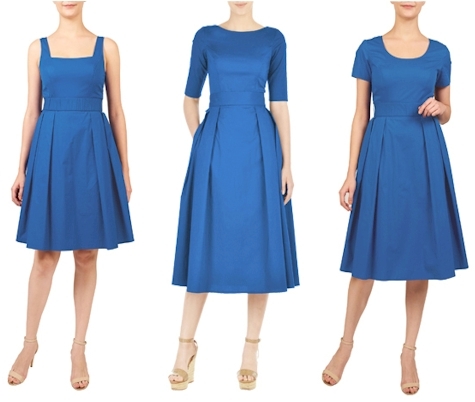 A giant thank you to my friend Chava Reimer for introducing me to this amazing website store: eShakti, which is basically a fashion-conscious, modest-dresser's, budget-shopper dream come true. Besides the wide array of sizes available (size 0 to size 36W), eShakti has some very fashionable offerings at incredible prices. Most of their dresses are in the $50.00 to $80.00 range. I love how most of eShakti's clothing is made to flatter a variety of body types, and how their models (and even their mannequins) aren't 6-feet tall size zeros with their hip bones protruding. But here's what really makes it different from all the other clothing stores: you can customize the length, sleeve, and neckline of any piece of clothing that they sell almost any way you want! 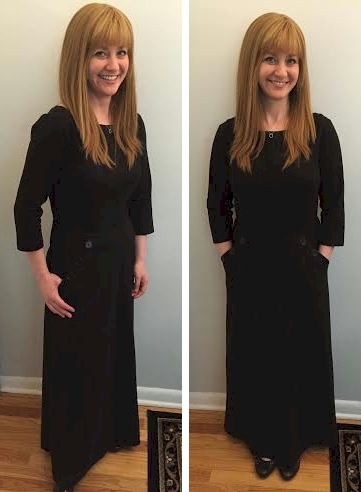 Chava was able to modify the sleeves and neckline of this dress, which is priced at just $66.95, for just an additional $9.95. Think for a minute how much it would cost to hire a seamstress or tailor to raise a neckline or add sleeves to a dress. Yeah. THAT'S how much money you save. Please keep in mind that not all customizable options are available for every item of clothing, and that there are some options (like pockets/no pockets) that are available on some things and not others. All clothing items, even customized ones, are RETURNABLE. Yessem. I said it and you heard me. And returns are FREE in the U.S., meaning eShakti picks up the return shipping for all U.S. orders! You can receive a full refund of the purchase price (but not any shipping fee or alteration fee). You can receive an eShakti gift card (basically a store credit) for the price of the dress, the alterations and the shipping fee. If you return it between 31 and 60 days, you'll receive an eShakti gift card for the price of the dress only (and you forfeit the shipping and alteration charges). eShakti ships from India (not China) and non-embroidered items will reach you 10 to 14 calendar days from the date your order is confirmed. Embroidered items and wedding dresses will reach you within 18 calendar days. They ship to both U.S. and Canada and eShakti absorbs all American custom charges. 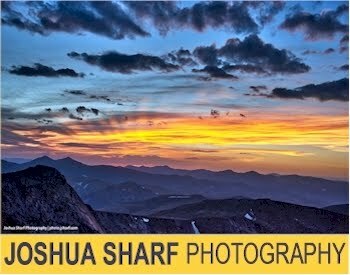 Shipping charges start at $9.00 for U.S. addresses (they don't offer free shipping, but this one of those rare instances that a deal is worthwhile even with a shipping charge). NOTE: eShakti is currently offering brand new customers a $25 e-gift card (no minimum purchase) and free shipping when you join their mailing list (link will be at the very top of the page). 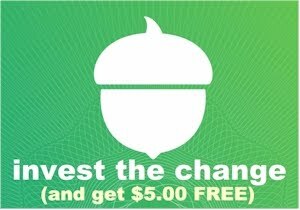 I have a special favor to ask of you guys....you know that I make my living from DailyCheapskate, so I humbly request that after you get your $25 gift card, you come back here and click on any link in this post before you shop, so that I can get my small commission from anything that you purchase at eShakti.